Due to so many requests from the users, source code for this applet is distributed with the ZIP files you will receive if you click get file for offline use button. Please do not ask me to send you the source code again! You are welcomed to check out another Collision 2D created with EJS. Press Start to begin the animation. Two circular objects will move with pre-defined velocity (yellow arrow). left/right to change its value (the initial velocity of that object). Click near the circular boundary and drag the mouse button to change its radius. Right Click near the boundary of the circle to change it's size (also change it's mass, at the same time). Click near the center of the circle and drag the mouse to change its location. Click the mouse button again to resume the animation. When the two objects collide, the animation will be suspend. Press the mouse button ( Do not release it) to see the velocity vectors just after the collision. Press Reset button to reset parameters to default values. for perfectly inelastic collision eta=0. You can select different frame of reference to view the relative motion of all the objects. left circular object m1, right circular object m2 and center of mass for m1 and m2. View collision in 1 dimension. At the moment when they collide, the force between the two circle objects is along the line which connect the center of the two objects. The vector perpendicular to the above components (green vectors) will not changed after collision. Please check out Rigid Body Collisions for 2D collision between rectangle shape objects. 2. Find the line connect center of two balls. and calculate the component of the velocitry for each ball alone the line connect those two balls. 3. It is become a 1D collision problem: ball A with velocity Vap collide with ball B with velocity Vbp . You should be able to calculate velocity after collision for each ball. is there any difference between balls or humans when collision occur? i am trying to write a human model for collision cases... and still trying very2 hard to make it in realistic way. your applet seems like good for me and i'm impressed with it... perhaps it would be good to be applied to my project.. can u explain it in detail how's the calculation for it? dividing it into 3 condition,(1.before,2. during..,3.after.. )would be really2 great... thanks.. The above calculation assume it is an elastic collision between two balls. i.e. No energy is loss during the collision. And the ball would not change shape. For collision betwen two human, we will change our body movment. Would you explain in more detail why you need to calculate collision between human? While two persons are walking or ...? for example... human A is trying to go to point 1... and if there is another human blocking his way... then.. the human A must avoid it.. by changing to other direction and then, go to point 1..
here... i can detect the collision if there is human blocking another human.. but, i have problem with changing direction... to make it realistic..
Because you want to avoid collision among human. So there is no collision among human. You can check the velocity vector, if it is pointing to another person. Then someone is blocking his way. Provide the horizontal displayment, you can calculate the least change of the velocity. The person can change direction right at that point or change velocity gradually. thanks.. i got the idea now.. Assume the radius for two ball are r1 and r2, and the coordinates are (x1,y1) and (x2,y2). However, there is a finite time step dt in the simulation calculation,so most often we would not be able to find the above condition (exact time when two ball real occurred). So we check if d<= r1+r2; Then we know the collision should have occurred. The correct way is to find the time when the two ball really collide with each other. and dt =(r1+r2-d)/(vp1-vp2);// the collision should have occurred at t-dt (Actually this is also an approximation). (ax,ay) is the unit vector in the direction connected two objects. Because we have move time backward dt, we need to move time forward dt. Now the distance between two ball will be larger than r1+r2. If you did not correct the time dt (before you have found collision occurred, you will find balls clutch together. and they don't even let go. sorry for bothering Its probably a 3 year old thread!!! Just wondering...what does vx0 represent in your code? Anybody looking into the physics of 2D and 3D- elastic collisions may also be interested in my pages http://www.plasmaphysics.org.uk/collision2d.htm and http://www.plasmaphysics.org.uk/collision3d.htm which represent direct and general solutions of the problems. I have also written corresponding Fortran and C++ codes for this ( see http://www.plasmaphysics.org.uk/programs/coll2d_for.htm , http://www.plasmaphysics.org.uk/programs/coll2d_cpp.htm , http://www.plasmaphysics.org.uk/programs/coll3d_for.htm , http://www.plasmaphysics.org.uk/programs/coll3d_cpp.htm ) which are free to use for everybody. Note that there was a bug in the collision detection routine of the 2D-versions of my programs (this led in certain cases to collisions being detected when in fact there were none). I have corrected this now. I have also made minor changes to the code in order to improve speed. Furthermore I have added a simplified version to the 2D-routines that does not not contain the collision detection routine but just returns the new velocities assuming that the input coordinates are already those of the collision. Is there a vx0 posted in this forum messages! Please explain what do you mean? You have missed the spin component caused by the collision. It may have been there before collision occured. The spin neglect is an ENORMOUS ERROR. The information is dangerous due to its over simplification. Yes, the ball will also rotate if there are friction force between balls when collide. This is just an applet try to help student to understand basic physics (how to transform a 2D problem into two 1D problem). I have been following these pages since its publication in january 2004, just happened to register today. I wonder how different will it be if we consider that the two colliding bodies are two circular discs. You might have heard of a board game called carrom , its very popular in India. Do take a look at it. Now we have tried to emulate the example you have put up here and applied it to the emulation of carrom. There are a few rough edges, but still the difference is not very clear. What changes will be necessary to make it work realistically? I do not know anything about carrom. Is there a URL for that? To add a rotation effect due to friction between two disks, the mathematics become more comples. The friction between two disks is proportional to the normal force when two disks collide. The normal force is the rate of change of momentum (in the direction between two centers) when two disks collide. The torque due to the friction will change the angular momentum for those two disks. 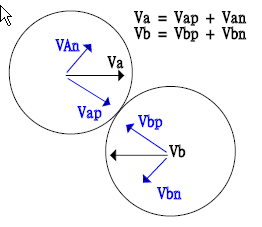 In 2D collision: vx,vy and w (angular momentum) are changed due to collision for each ball. There are 6 variables need to be update for two balls, so you need to solve 6 equations. You just need to solve the problem differently for non- perfect elastic collision. Momentum is still conserved. But the energy is not conserved. I keep trying to prove your equation by using the assumption that kinetic energy is not lost and momentum is not lost but I keep getting a different answer to yours. Could you give me some pointers about how to do solve it. SOLVED! Im doing this experiment for my A level coursework and I found that typically 90% of the mommentum is lost. Have I made a mistake? But this is for an elastic collision. For an partial inelastic collision which equation do I use for kinetic energy? Do you lose a certain amount of energy or is it a percentage of energy lost? This article is fantastic and has helped me a lot, but I am wondering if you might be able to help me out with a problem I have. I have made a program where I have multiple balls on the screen, each moving at a random velocity and in a random direction. The problem I have is that when 2 balls collide, they will often stick to each other (especially when ed is < 1) and spin around orbiting each other. Each of the balls has a radius of 15, and so my collision detection is very simple, when the distance between two balls is <= 30 then there has been a collision. So, the problem is that when the distance is less than 30, (say 25), then they are overlaping by 5, when I next update the positions of the balls, if they havnt moved more than a distance of 5 away from each other since the last update, then they are still overlapping and the collision is still true. So, what I need to do is before the next update, I need to move the balls appart from each other a distance of 5 in the new direction after the impact. But I cant seem to figure out the maths to do it. Also, I have implemented a bit of code to help handle when 3 or more balls collide at the same time, but it doesnt quite seem to work right. Do you have any tips for this? The real collision should have occured before you detected that the distance between two center of the balls d is less than the sum of those two balls r1+r2. The correct way is to find the time when the two ball real collide with each other. Apply the collision to calculate new velocity for those two balls after collision. You can check out another simulation created with EJS and find out how I did it with EJS. when two atoms collide using Conservation of Momentum and Energy we get expression for E2 = 4M1M2 cos square phi E0/(M1 + M2)square. Can U suggest me how this has come. What is the situation you want to discuss about? There is no way to discuss if question is not well defined! What are the meaning for E0,E2 and what is the formula you want to show? And how did you get that formula? I am currently working on the following question and was wondering if you could offer any help. I'm just not sure how to factor in the 30 degrees. this is of course a completely elastic collision. any help would be great. Two pool balls are rolling along a pool table. The red pool ball has a velocity of 10 cm/s west and the blue ball a velocity of 10 cm/s north 30° east. What are the velocities of the balls after the collision? You can find out the answer easily. Just use mouse to drag the velocity vector for each ball in the simulation (conditions match with your problem) and find out the answer by yourself! but i need to learn how to do the calculations myself. So if you could help me with some formulas that include the vectors of the balls that would be great. Please look at all the forum messages in this topic carefully, all the steps (in detail) have been posted. I guess you did not read this forum messages carefully. If you did read it and still did not understand it. Please at least indicate where you did not get it. You can see something wrong ?